In Pamplona the running of the bulls is governed by a series of regulations and customs imposed by age-old traditions. In addition all runners must comply with the legal notice issued by the Pamplona city council and with the Navarre law on bull festivals. - Under eighteens are not allowed to run. - It is forbidden to go beyond the police barriers before the bull running starts. 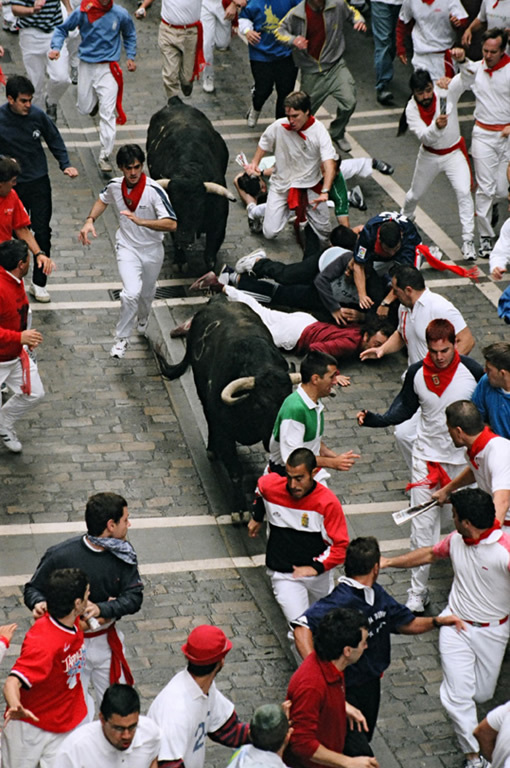 - It is forbidden to take shelter in doorways, corners or dead angles along the route before the bulls have arrived. - House and shop doorways must always be closed. - It is forbidden to run under the influence of alcohol or drugs. - It is forbidden to carry photo or video cameras and to wear inadequate footwear or clothing for running. Neither is it permitted to carry large objects which could cause mishaps during the bull running or hinder other runners, such as rucksacks, packages, large hats, etc. - It is strictly forbidden to incite the bulls of attract their attention by any means. This rule is particularly applicable in the bullring. - It is forbidden to grab hold of, whip, cut off or run towards the bulls; the herd needs to be helped to run in the correct direction along the route - never backwards - and the run duration should be as short as possible. Before the run, the P.A. system installed in the Town hall square broadcasts these prohibitions in Spanish, English and French, and the mayor or councillor for citizen protection, accompanied by the head of the municipal police, inspects the route to check that the regulations are being complied with.